User Voice and HM Inspectorate of Probation have begun work on an exciting new Service User Engagement Pilot. User Voice will pilot a service user engagement project as part of the Full Joint Inspection (FJI) Programme, which is a joint inspection programme led by HM Inspectorate of Probation and involving a number of partner inspectorates, to reflect the breadth of partners involved in youth offending work. This pilot is taking place in a Youth Offending Team in June and July 2013 and involves ensuring the views of young people who have offended and their parents and carers are included as part of the Full Joint Inspection Programme. The pilot will end with a co-production event involving elected youth reps from the inspected Youth Offending Team (YOT) engaging with YOT staff to discuss findings from the pilot. HM Inspectorate of Probation is the inspecting body of Youth Offending Teams in England and Wales. It is an independent Inspectorate, funded by the Ministry of Justice, and reporting directly to the Secretary of State on the effectiveness of work with adults and children and young people who have offended aimed at reducing re-offending and protecting the public. For further details contact Anne-Marie Douglas: amdouglas@uservoice.org. On the 2nd July 2013 User Voice staff and volunteers attended and spoke at the Criminal Justice Convention 2013 on reducing offending and reoffending. Bob Ashford, founder of Wipetheslateclean and User Voice Advisor, chaired two sessions and spoke at another two during the event. Jude Jubey, a member of one of our Youth Advisory Groups, joined Bob in a session where they used their own experiences to reflect on the issues associated with criminal convictions, employment and volunteering and the long-term impact of criminal records on people’s lives. 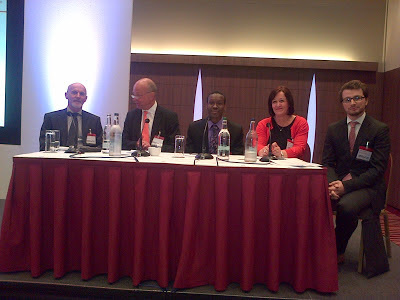 They both also participated in a panel discussion with other youth justice professionals; the discussion, titled ‘Catch Them Young’, included John Drew, Professor in Comparative Youth Justice, Cédric Foussard, Director of International Affairs and International Juvenile Justice Observatory, and Kate Morris, Deputy Chief Executive for Effective Practice, Youth Justice Board for England and Wales. The event was a fantastic opportunity to create more awareness of what User Voice do among many influential people from the YJB, police, probation and other organisations that attended. Jude Jubey was praised for his inspiring speech about the issues he has encountered with employment and volunteering from his criminal conviction.